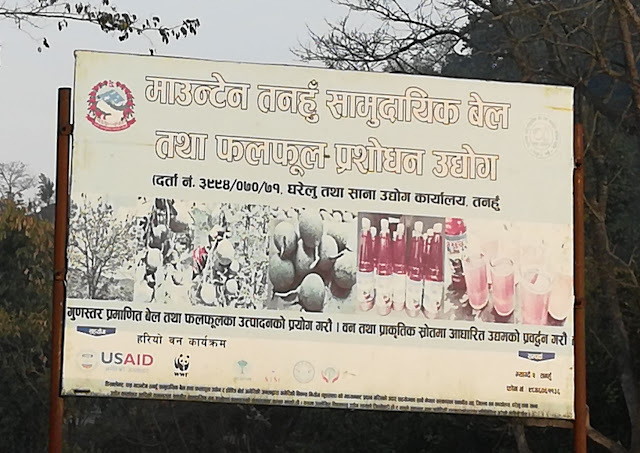 Mountain Tanahun Community Bel and Fruit Processing Enterprise is the Enterprise established focusing production and processing juice of Bel (Aegle marmelos) in Myagde Rural Municipality - 2, Jamunae (previously on Jamunae V.D.C. - 4). This enterprise operated in the participation of locals from six community forestry. This enterprise was established in 2071 B.S. This enterprise was registered in Home and Small Scale Bussiness Office Tanahun with registration number 3994 in Fiscal Year 2070/071. This enterprise is awarded the fourth prize of amount 5,000/- in National Exhibition - 2073. This enterprise now produces the products beside Bel juice other enterprise products are Ginger juice and Lapshi Madha. This enterprise directly creates employment for seven people and indirectly involvement is higher up to 50-60 during harvesting seasons of Bel fruits Baisakh to Shrawan (April - July). This enterprise is utilizing wasting Bel-fruit for the production of Bel-juice and take a commercial shape. This product is new to the market as it is the new production and required skilled accordingly with required training also identifying its market was challenging factors during establishment. Packing and delivery to market. Why and How Bel Juice Production and Processing Enterprise Established? With the growth of population and increasing, urbanization and change in lifestyle create the use of various chemically contaminated products and consumes food poisoning chemical in an unnecessary amount that makes felt the importance of organic products without harmful chemical contamination. Thus, in recent years, various natural fruits have come up in priorities and people choice. Considering these all community forests interested in investing in Bel juice production and processing enterprise in support with the partner organization. Establishment of forest-based enterprise in community forest has its own difficulties. In addition to that, this is the enterprise operated by six community forests thus, gathering all those in a single platform is the first challenge. However, it's able to bring them all in a place. Following all these the additional problems is no initiative from the government, no discounts for community-based forest enterprise in Tax Policy. Especially, to check out the food quality of Bel Juice and other products they have to sent sample to the far distance for this organization and around the products need to be sent to Bhairawa. Transportation of Bel juice or liquids has its problems. Fuel problem during enterprise production. No permanency of the workers creates additional problems. Investment of money from all the groups together has a problem. The representative from every community forest has solved some problem however, the regular participation can't be insured due to far distance. This can be regularized with particular time schedule preparation for the organization regular gathering. Policy for the operation of the forest-based enterprise and Tax Policy should be revised for the easiness of enterprise. Checking food quality facility should be available either in district level or Province level so that time consuming during food quality check would be reduced significantly and adds easiness. Damauli or Pokhara would be in a convenient distance. Incentives should be given for the transportation of liquids containers. Electrification of the fueling system would help to reduce fuel problems. Workers need to be ensured about their living from a significant amount of earning. A mechanism should be made to invest income in the community-based forest enterprise.